Saint Nikolai Cathedral (Russian: Николаевский собор, Armenian: Սուրբ Նիկոլայ Մայր եկեղեցի (Surb Nikolay Mayr yekeghets'i)) was a Russian Orthodox cathedral in Yerevan, Armenia and was destroyed in 1931. It was located at the site of what is now Shahumyan Square in Yerevan's Kentron District. The Russian Orthodox Cathedral of St. Nikolai was located in the middle of the north-eastern side of the Cathedral Square (now Shaumyan Square) area. According to O. Khalpahkhyan, this Russian military cathedral at the central square of Yerevan, was built in the second half of the 19th century. The cathedral was built by local red and black tufa in the architectural forms that prevailed at that time in Russia. 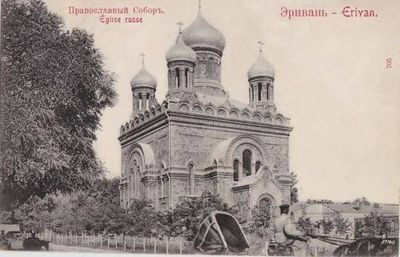 The cathedral was destroyed in 1931, and later Shahumyan Square was built in its place. The cathedral with surrounding area in the Fortress St. This page was last edited on 27 September 2018, at 16:23.